Journal of the Telegraph, 1873. Ottawa, Illinois, from the late 1860s. The following article was originally published in the Telegraph and Telephone Age - February 16, 1918. It probably represents the earliest list of telegraph manufacturers that was compiled. It includes nearly sixty firms and people associated with the U.S. telegraph manufacturing industry. The article was prepared by the editorial staff of the Telegraph and Telephone Age using material from the files of Donald McNicol. Canadian-born McNicol was a telegrapher, author, historian, technical instructor at Columbia University, and, when this article was published, the assistant engineer for the Postal Telegraph Company. The following year, McNicol became the editor of the Telegraph and Telephone Age. T hose who have had the good fortune to come into possession of an early make of telegraph relay, sounder or key are, in many instances, at a loss in trying to establish the date of manufacture of their prize. While, in most cases, the instrument bears the name of the manufacturer, there is no clue as to the year in which it was made. The following information from various sources has been gathered for the purpose of aiding those who wish to identify the date of manufacture of old time instruments, and, also, to call attention to the large number of instrument makers in the business forty years ago compared with the half dozen concerns engaged in the same line of business at the present time ( 1918 ). It might here be stated, however, that a considerable number of the "firms" herewith listed consisted of small up-stairs shows in which the president was also shop superintendent, sales engineer and stenographer. The port rules and registers used by Professor Morse in his first public demonstrations, and which were taken to Europe by him to be submitted as models in securing foreign patents covering his invention, were made by William Baxter and Alfred Vail in the shops of the Speedwell Iron Works, at Morristown, N.J., in 1837-38. The first embossing registers employed made in 1843 by Philip Schuyler and by Gilbert Smith weighed nearly two hundred pounds, due to the fact that the electro-magnets of these instruments were wound with No. 16 gauge insulated wire; being the same guage as the line wire used. James Clark and Sons, (Note 2.) Philadelphia, (Clark & Son) under the direction of Alfred Vail, Morse's assistant, also by (John) Stokell, (Clock maker)of New York. Registers were made in New York by Charles H. Dubois for Morse Lines in 1850. In 1865 (this should read 1845) registers were made by J. (Joseph) Burritt & Son, Ithaca, N.Y. Some of the earliest relays used were made by Thomas Hall, of Boston, and by Dr. R. B. Donaldson, of Washington: also, by Daniel Davis, Jr., of Boston, between the years 1842 and 1848. (Note 24.) The relay manufactured in 1847 by Davis by general use was claimed to be superior to the instruments being used at that time by Professor. Morse. In 1852 the Norton Telegraph Works (Note 4.) at Broadway and Broome Street, New York, manufactured telegraph instruments: C. T. Chester was shop superintendent. The first keys used were similar in construction to the circuit closer, in later years known as a strap key. Some of the earliest keys of a more modern design were made by Thomas C. Avery, of New York, about 1848. Daniel Davis established a shop in New York about 1845, which was later taken over by Palmer and Hall, which latter firm remained in the instrument manufacturing business in New York but a short time. Palmer and Hall maintained a shop in Boston as late as 1850. Mr. A. S. Chubbuck, of Utica, N.Y. Registers used on the first lines in Canada were manufactured by Chubbuck. In the West a number of small independent telegraph companies were organized, beginning about the year 1851. Some of the instruments used on these lines were made by Blattner, of St. Louis. 1. Samuel J. Burrell, printing telegraph instruments, 50 Broad Street, New York. 3. S. F. Day and Company, Ballston Spa, Saratoga County, N.Y.
5. Hicks and Shawk (prior to 1869 this was a Western Union shop, Mr. Shawk, foreman), Cleveland, Ohio. Mr. George B. Hicks, of repeater fame, was president of this company. Telegraph Supply and Manufacturing Company, under the management of Mr. Hicks and J. H. Hessin. Mr. Hicks died in May, 1873. The company was continued under the management of John E. Cary and George W. Stockley. In 1884 the company was managed by W. B. Cleveland at the original location, 144 Superior Street. 6. Gray and Barton (Elisha Gray and E. M. Barton, 1869-1872), 479 State Street, Chicago. In 1872 taken over by the newly organized Western Electric Mfg. Company, Chicago. 7. F. L. Pope and Company 80 Broadway, New York. In May, 1872, moved to 194 Fulton Street and in 1873 to 38 Vesey Street, New York. 8. M. A. Buell , 1872-1884, 26 Warning Block, Cleveland, Ohio. In 1884 consolidated with the business of W. B. Cleveland, 144 Superior Street. D. W. Putt and Company, Wellsville, Ohio. Also see the following web page on the history of the L. G. Tillotson Company: L. G. Tillotson & Co.
George H. Bliss and Company, with headquarters at 41 Third Avenue, Chicago. In 1874 Bliss, Tillotson and Company opened a factory at 54 South Fourth Street, Philadelphia. 11. Electric Telegraph Works (Fleming, Potter and Company), Second and Chestnut Streets, Philadelphia, Pa.
14. H. D. Rogers and Company, Cincinnati, Ohio. 16. Dr. L. Bradley, (1869), 9 Exchange Place, Jersey City, N. J. In January, 1873, Dr. Bradley discontinued the manufacture of telegraph instruments and continued making electrical measuring instruments only. 19. George H. Crain and Company (Henry Clusky), 145 South Clark Street, Chicago, Ill.
20. Watts and Company, 47 Holliday Street, Baltimore, Md., in business in March, 1873. 21. Washington Telegraph Agency, 1711 G Street, Washington, D. C., under the management of Mr. Geo. C. Maynard (now Curator Technology Division National Museum, Washington, D. C.). 22. Canadian Telegraph Supply Company, 352 King Street, Toronto, Ont. 24. E. B. Welsh and Geo. L. Anders, 30 Hanover Street, Boston, Mass. Makers of dial telegraph instruments and printers. 25. Co-operative Manufacturing Company 216 � Walnut Street, Philadelphia, Pa. In 1874 managed by Mr. W. R. Baldwin. Partrick, Carter, and Wilkins, but they have not manufactured telegraph apparatus for many years. 28. J. J. Clark and Company, 19 East Twentieth Street, New York ( 1861-1866 ). 29. J. H. Longstreet, 8 Barclay Street, New York ( 1880 until 1888 ). Western Electric Manufacturing Company. The Chicago factory succeeded by purchase or consolidation to the business of the Caton Instrument Shop maintained by the Western Union Telegraph Company at Ottawa, Ill., and to the business of Gray and Barton, Chicago; Geo. H. Bliss and Company, Chicago; Electric Improvement Company, Galesburg, Ill.; C. Williams, Jr., Boston; Gilliland Telephone Manufacturing Company, Indianapolis, Ind. The New York works of the Western Electric Company were the outgrowth of the electrical shop maintained by the Western Union Telegraph Company, which was taken over in April, 1879. By the year 1882 this company had issued fourteen catalogues of electrical apparatus, which were sold at from three cents to twenty cents each. Also see the following web page on the history of the E. S. Greeley Company: E. S. Greeley & Co. The Bunnell Telegraphic and Electrical Co.
also, L. S. Brach Company, Newark, N. J. C. H. Dubois and Son, No. 61 Ann Street, New York, were in the telegraph instrument repair business from 1888 until 1916. The foregoing information has been taken from records belonging to Mr. Donald McNicol, assistant engineer, Postal Telegraph-Cable Company, New York, whose files contain extensive data relating to the historical development and organization of and inventions in telegraphy. advertising products prior to 1918. Cleveland, Ohio Ayers, Tillotson & Co.
Cleveland, Ohio Crane, Moses G. & Co.
Baltimore, Md. Delany Telegraphic Transmitter Co.
Thomas J. Dunn & Co.
Boston, Mass. Electric Merchandizing Co.
(Fleming, Potter & Co.) Pine & Chestnut St.
Electrical Construction & Maintenance Co.
San Francisco, Calif. The Electro-Magnetic Mfg. Co.
New York, N.Y. The Empire Electrical Mfg. Co.
27 to 35 Walworth St.
New York, N.Y. Foster, James M.
(Note 27.) The Gamewell Fire Alarm Telegraph Co.
New York, N.Y. Gold and Stock Telegraph Co.
(F.C. Smith) 1041 Penn. Ave.
Chicago, Ill. The Illinois & Mississippi Telegraph Co.
Houston, Texas Jones, C. E. & Bro. The Lewis & Fowler Mfg. Co.
Cleveland, Ohio F.G. Mack & Co.
New York, N.Y. Mona Manufacturing Co.
(successors to A.B. Lyman & Co.) 36 South Water St.
Cleveland, Ohio Omnigraph Mfg. Co.
New York, N.Y. R. K. Pearce & Co.
Providence, R.I. Phonic Receiver Co.
New York, N.Y. Post & Co.
D. W. Putt & Co.
Wellsville, Ohio Railways Labor-Saving Device Co.
Davenport, Iowa Jerome Redding & Co.
New York, N.Y. Simplex Co.
No. 162 South Water St.
Chicago, Ill. The Standard Electric Co.
Olean, N.Y. U.S. Vailograph Mfg. Co.
Janesville, Wis. Viaduct Manufacturing Co.
Worcester, Mass. C. Westbrook & Co.
(a) In 1845, it was William Clark's shop as, "Clark and Son." James was his seventeen year old son who later ran the business until 1868. (b) "My father, William Clark, was then (1845) engaged in the manufacture of mathematical and nautical instruments. I was detailed by my father to do the odd work about the (new) telegraph office, (a new telegraph office just opened in the Exchange Building in Philadelphia.) such as attaching platinum at points in the instruments and drilling holes and soldering, and soldering wire in anvils for keys, etc. At that time the keys did not have legs as they now have, and, in fact, many of the niceties were lacking then." (d) "I made the first relays that were used as sounders. These were made for Wells, Fargo and Company, who built a line across the continent in opposition to the Western Union and used these instruments because they were not permitted to use a local circuit, as the Morse patent covering that device was still in force. These instruments were made with a double base, the upper base being about three-sixteenths of an inch thick and was struck by the lever of the relay, which was made heavier than usual. It answered very well. The first of these instruments had the upper base made from the sounding board of an old piano." Ref. By James J. Clark, "Telegraph Age," November 16, 1906. (3.) L.G. Tillotson & Co.
(a) L.G. Tillotson & Co. addresses and years of operation are listed below. Ref. 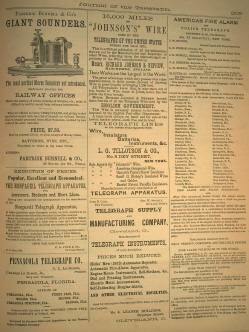 New York City Directories, "The Telegrapher," and the "Journal of the Telegraph." 1862 Tillotson & Co. with James S. Keeling occupying a small part of store at 262 Broadway. 05/01/1864 Tillotson & Co. Ad 262 Broadway/ with James S. Keeling/ "R.R. Supplies & Telegraph." 05/01/1865 Both James Keeling and Luther Tillotson listed as "merchants" at 16 Broadway. 11/01/1865 Tillotson & Co. re-organized as L.G.Tillotson & Co. with partners General E.S. Greeley and W.H. Holt at 26 Dey St.
11/15/1865 A business Ad announces the formation of L.G.Tillotson & Co. at 26 Dey St.
12/01/1865 Opposing full page ads for Keeling's, "Late, Tillotson & Co." and L.G. Tillotson & Co.
1865-1868 L.G. Tillotson & Co. 26 Dey St.
05/02/1868 L.G. Tillotson & Co. moves to 11 Dey St.
11/02/1868 L.G. Tillotson Ad shows the addition of G.B. Gavett Jr. to the firm. 1868-1870 L.G. Tillotson & Co. 11 Dey St.
06/01/1870 L.G. Tillotson & Co. moves to 8 Dey St.
1870-1879 L.G. Tillotson & Co. 8 Dey St.
04/16/1879 L.G. Tillotson & Co. moves to 5 & 7 Dey St.
1879-1885 L.G. Tillotson & Co. 5 & 7 Dey St.
1885-1887 Some ads still list L.G. Tillotson & Co. 5 & 7 Dey St. even though the firm was re-organized as E.S. Greeley & Co. soon after L.G. Tillotson's death. *During the years 1864-1866, Luther Tillotson maintained his position as the Superintendent of Telegraphs for the Erie Railway Company. (b) "..We noticed one feature in the manufacture of machinery which has been too long neglected, perhaps because some have thought that it was against the interests of manufacturers to adopt. We refer to having all the parts of an instrument made by some distinct model, and so that every part made is a duplicate, complete and perfect, of the former. So here we were pleased to find that binding screws, armatures, cores, levers, posts, springs, keys, and parts of keys, wheel trains and axles, the screws for the different parts, flys, stops, rollers, winding barrels and everything were made upon distinct models, and thus one machine made the duplicate of the other. The advantage of this must be obvious. When a part of an instrument has given out, the whole instrument has frequently had to be set aside or shipped to a great distance for repair. Many instruments have thus been lost. Now nothing is necessary but to order the duplicate of a certain part and at once the machine is complete as ever. ...The lathes are supplied with the drills of the exact depth required, and thus all is turned out with the exactitude of a watch. There is great economy of labor in all this, great opportunity for perfection, but the chief advantage is that of the absolute similarity of the parts and their applicability to any machine." (Observations made during a visit to the L.G. Tillotson & Co. factory at 137 and 139 Elm St. New York, N.Y.) Ref. ""Journal of the Telegraph," March 15, 1869. J.W. Norton was located at 177 Broadway, New York City, 1851-1852. They supplied instruments and supplies to The New York and Erie Railroad. Ref. Charles McCluer, J.W. Norton clerk, "Telegraph & Telephone Age," June 1, 1911. (a) "This firm are also largely engaged in the manufacture of first-class engineering and surveying instruments. Registers, however, seem to be their particular specialty. In Fact, Knox and Shain's registers are about as well known throughout the United States as the telegraph itself, and can be found in almost every country railway station from New York to New Orleans and Omaha..." Lists address as 218 and 220 Walnut Street. Ref. "The Telegrapher," September 12, 1868. (b) All the telegraphic apparatus used on the lines of the Pennsylvania Railroad were made in the railroad's company shops located in Altoona, Pa. with the exception of the Morse registers which were purchased from Knox and Shain of Philadelphia. Ref. "The Telegrapher," July 29, 1871. (c) "Joseph Knox, who had been engaged in the manufacture of Electrical and Telegraphic apparatus in Philadelphia for 40 years, the last 28 of which as the senior partner of the well known firm of Knox and Shain, died in that city Feb. 14, 1877, aged 72 years. Mr. Knox was regarded as one of the best practical mechanics in the country, and was highly esteemed in all the relations of life." Ref. "Journal of the Telegraph," March 1, 1877. (d) Ad in 1879 still shows the firm in business two years after Joseph Knox's passing. The ad shows registers being offered at $25.00. Also states the firm was "Est. 1850." Ref. "Journal of the Telegraph," October 16, 1879. (6.) Chester, Partrick & Co.
"Although this enterprising young firm has been established less than a year, they have already secured a large and constantly increasing business. Mr. Stephen Chester, the senior partner, is the brother of the well known Chesters of this city. (NYC) Mr. Partrick is an old experienced Telegrapher, and the value of a practical man in this business is at once apparent upon inspecting the minor details of the instruments manufactured by the firm, and on exhibition at their warerooms. The registers and keys which they furnish are of especially neat and serviceable patterns. Relay magnets, sounders, switches, lightning arresters, and every variety of apparatus, batteries and other material, are kept on hand and made to order." (a) "The establishment of Mr. Williams is located at 109 Court Street, and though but a short time since damaged by fire, is again in full blast. Very little apparatus, except that used for Telegraphic purposes, is manufactured here, and in this particular branch the work is of a most excellent character, consisting of Repeaters, Switch-boards, Relays, Registers, Sounders, Keys, Rheostats, Galvanometers and batteries, all of which are made in large quantities. The most noticeable instrument manufactured here is the well known "Boston Relay," of which a large number are turned out weekly, mostly for use on railroad wires. Ten men are employed here." Ref. "The Telegrapher," August 15, 1868. (b) "...Mr. Williams exhibits two relays, two sounders and a register, as well as half a dozen keys of different patterns. There is, of course, nothing especially new in principle about these instruments; but in point of elegance of design, and beautiful and accurate workmanship, they cannot be surpassed by the productions of the best European workshops. These are, beyond question, the finest instruments which have ever been publicly exhibited here. As designers of apparatus American workmen are in advance of those of Europe, but they generally fall behind in point of accuracy of workmanship, especially in the nicer details. But the manufacturers themselves cannot be greatly blamed for this result, as long as telegraph and railway companies insist on having the cheapest instruments it is possible to produce, regardless of quality of performance..."
Ref. A report on the exhibits at The American Institute Fair by Franklin Pope, "The Telegrapher," October 23, 1869. "William E. Davis, of 319 Newark Avenue, Jersey City. The instruments shown consist of keys, relays and sounders, all of which are of somewhat novel construction. The key is provided with a self-closing attachment, which is better than any hitherto brought-out-for those who like that kind of key. Most operators prefer an ordinary key, with the spring taken out, for a self-closer. ...The Relays have their armatures suspended like a pendulum, and close the circuits by striking and pressing two springs together, which are not electrically connected with the other portions of the instrument. The sounder is arranged so that the lever strikes upon a hollow drum of vulcanite, with a brass head, which gives a sound of peculiar distinctness, especially among a number of other instruments." 1868 The Western Union Cleveland shop was absorbed by the Western Union Ottawa shop in the fall. Ref. "The Telegrapher," January 15,1870, August 19,1871, "Journal of the Telegraph," July 1, 1870. (a) "We confess to a feeling of surprise in finding at the establishment of Charles T. and J. N. Chester, on a casual visit there a few days ago, forty skillful men all engaged on the construction of telegraphic machinery. Much of the work done by the Chesters is on machinery the product of their own skill, Mr. Charles T. Chester being one of our finest electricians and practical mechanics. Like the firm of Tillotson & Co., this house has a national reputation, and is known for the beauty of its workmanship, and the high character of the brothers who compose the firm. The firm of Partrick Chester & Co., of Philadelphia, is a co-operative branch, and has a large and increasing trade." Ref. "Journal of the Telegraph," June 15, 1868. (b) "Mr. (Charles) Chester was born January 26, 1826 and was in his fifty-fourth year when he died. He graduated from Yale College in 1845, and commenced the study of medicine, which he pursued for about nine months, when, in order to assist his father, who had been unfortunate in business, he commenced the practical study of telegraphy in or near New Haven, Conn., and was thereafter engaged in practical telegraphic duties until about 1853, when he engaged in business with Mr. John W. Norton, then the principal dealer in this city (NYC) in electrical and telegraphic apparatus and supplies. In 1854 he commenced business for himself, in the same line, at the corner of White and Centre Streets, subsequently removing to 104 Centre Street, where he was still engaged in the business at the time of his death. In 1856 he took his elder brother, John N. Chester, who had been his book-keeper, into partnership, under the firm name of Charles T. & J. N. Chester, which continued until the death of the latter, in 1871. This firm took the contract for the erection of the present system of Fire Alarm Telegraph in this city, which they successfully completed. He was the organizer of the Manhattan Quotation Telegraph Company, since merged in the Gold and Stock Telegraph Company, and was prominent in the organization of the Law Telegraph Company, of which he was at first the engineer, and was the originator of the National Light and Power Company, of which he was the electrician. Mr. Chester, during the time he was in business, made a number of inventions and improvements in electrical and telegraphic apparatus, some of which are still advantageously used. He was also always ready to aid meritorious inventors and inventions, and in this way expended much money, not always to his own pecuniary advantage. Of late, his business and profits had been reduced by active competition, but he was always hopeful and sanguine, and continued his operations in the expectation that better times and the rapid development of the telegraphic business would enable him to retrieve his loses, and re-establish him again as a successful business man in his chosen department." Mr. Charles Chester passed away April 13, 1880. Ref. Taken from the Obituary of Charles T. Chester, "Journal of the Telegraph," May 1, 1880. (a) "As will be seen by the advertisement in this paper, Partrick and Carter, of Philadelphia, have removed from the stand they have so long occupied at No. 38 South Fourth Street, to enlarged quarters at No. 114 South Second Street in that city. They having combined with their telegraphic trade since January 1st, the business of railroad, steamship and mining supplies, additional room and more extensive facilities were needed and obtained in their new quarters." Ref. Removal of Partrick and Carter, "Journal of the Telegraph," February 1, 1879. (b) "James Partrick, of Philadelphia, died on the 7th inst., at Atlantic City, N.J., of typhoid fever, after a short illness. He had gone to the seashore in apparent good health in the early summer, with his family, intending to pass the the season there at his pastime of fishing and sailing, little dreaming that he would cross 'over to the other side' while lying within site and sound of the ocean he loved so well. He was an authority upon electrical matters, and his opinion and advice was often sought. He was a man of kindly heart and never missed an opportunity to perform a good deed - as many can testify who have applied to him..."
Ref. "Journal of the Telegraph," September 20, 1884. (a) "...Mr. Pearce was born in London, England, in 1843. In early life he was employed in the factory of his father, who manufactured electrical instruments for Elliot Brothers, of London. Young Pierce came to America in 1863 and found employment with Charles T. and J.N. Chester, in Centre street, New York, one of the earliest concerns in this country to engage in the manufacture of telegraph instruments. While thus employed he devised and constructed the principle instruments now used in the central office of the fire alarm telegraph in New York, and adopted in many other cities of the country. In 1872 he embarked in business on his own account, establishing the firm of Pearce and Jones. Since the retirement of Mr. Jones, a number of years ago, Mr. Pearce has conducted the business under his own name, and is now located at Nos. 18 and 20 Rose street, New York. His specialty of manufacture is fire alarm and police telegraph apparatus." Ref. "The Telegraph Age," October 16, 1904. (b) "The business of Frederick Pearce; 18 and 20 Rose street, New York, has been incorporated and hereafter will be known as the Frederick Pearce Company. Mr. Pearce becomes president of the new corporation; his son, Charles F. Pearce, vice-president, and George H. Tamlyn, secretary and treasurer. These gentlemen, together with Walter H. Pearce, another son of the president, constitute the board of directors. The manufacture of electrical instruments, mainly those used in fire alarm and police devices, will be continued as heretofore, and the company will also deal as usual in telegraph, telephone and electrical light apparatus." Ref. "The Telegraph Age," May 1, 1905. (13.) The Manhattan Electrical Supply Co.
(a) "One of the largest concerns in this country engaged in the manufacture of electrical supplies, as well as dealing in the same both wholesale and retail, is that of the Manhattan Electrical Supply Company, of 32 Cortlandt street, New York. This house occupies a unique position in reference to the telegraph trade, for it is a noteworthy fact that the executive officers of the company, as well as a number of its employees, are old time telegraphers. Their graduation from the key into the field of manufacture, especially in that branch of it devoted to goods required in the telegraph service, has naturally given this concern a grip on telegraph business, and their operations within that field have expanded to large dimensions. Their success in this specialty may largely be attributed to that innate knowledge, gained by practical experience, of what the peculiar demands of telegraphy are. At their extensive works in Jersey City there are ample facilities for turning out all kinds of telegraphic goods promptly and in any amount desired. Here special experimental devices are carefully wrought out and many a telegrapher has been aided in having his sometime crude ideas put into practical design. The officers of the company are J.J. Gorman, president; H.T. Johnson, secretary and treasurer; E. Whitmore, manager; B.H. Ellis, assistant treasurer, with D.C. Keefe, chief stock clerk and J.W. McDowell chief traveling representative." Ref. "The Telegraph Age," December 1, 1903. (b) Manhattan Electrical Supply Co. addresses and years of operation in New York City. Ref. New York City Directories, Manhattan Telephone Directories. 1892 36 & 46 Cortlandt St. (14.) J.H. Bunnell & Co. Time line for the early years of the company. 1880 �� Ads now show J.H. Bunnell & Co.
John Ghegan Gen. Mgr. 110 - 116 Beekman St.
moves to 20 Park Place <-----------------February 10, 1900 ������������ Dewitt� Bunnell (son) Gen. Mgr. | Expands 110 to 120 Beekman St.
v of J.H. Bunnell & Co. Inc.
������������ as J.H. Bunnell & Co. Inc.
John Ghegan v.p. & Gen. Mgr. ��� John Ghegan, pres; Charles Graham, v.pres. ���� Charles Merritt, treasurer & Jesse Bunnell Jr.
"Mr. Facer's establishment is not very large at present, but if he continues to turn out the quality of work exhibited in his case of samples, he will speedily have occasion to enlarge it. The instruments made by Mr. Facer do not differ materially in design from the usual patterns. In common with most of the Philadelphia manufacturers, the adjusting spring of the sounders and registers are arranged to act directly against the armature, thus relieving the bearings of the lever from much unnecessary friction. ...A new repeater of Mr. Facer's invention was also shown us, which is in use on the Pacific and Atlantic, and Bankers and Brokers' lines, and is highly recommended by Telegraphers using it. The manufacture of medical electric instruments forms a considerable part of the business of this establishment..."
(16.) C. Westbrook & Co.
"We take pleasure in calling attention to the advertisement in this paper of C. Westbrook & Co., successors to James J. Clark, at Harrisburg, Pa., as manufacturers of telegraph instruments and supplies . Mr Westbrook's reputation as an electrician, and the excellent mechanical talent comprised in the new firm, will insure satisfaction to all who may patronize them." Ref. "The Telegrapher," December 4, 1869. "...The senior member of this firm, Mr. George B. Hicks, is well known as an able electrician and telegrapher, and the inventor of the Hicks Automatic Repeater, which has come into more general use than any repeater ever invented and introduced. Mr. Shawk, for several years, and until it was given up by the company, had charge of the Western Union shop at Cleveland, and is an expert manufacturer of electrical and telegraphic apparatus..."
Ref. "The Telegrapher," August 19, 1871. "...We found the 'Insulator Man' (David Brooks) up to his eyes in business, and the works running night and day, turning out insulators at the rate of fifteen thousand per week - the inevitable result of getting up a good thing and then advertising it in 'The Telegrapher.' The greater part of those now making are supplied to leading railway companies, to whom an efficient Telegraph department, equally reliable in all sorts of weather, is invaluable. Many thousands of them have also been shipped to California, South America and Europe. At the time of our visit the works were just completing a large order for the Western Union Company. Four or five different varieties of insulators are now made here, one of the latest being composed of earthenware, saturated with paraffine, which has thus far given wonderful results under the most severe tests, its resistance greatly exceeding that of any known insulator." (a) According to his obituary, he was one of the first makers of telegraph instruments and some of them were used by Samuel Morse. He was associated with James Clark in the development of the Clark repeater.He invented the Splitdorf ignition coil and other electrical "appliances." It was stated he was the first to use asbestos as an insulating material. He passed away October of 1916 at the age of 83. His son Charles, continued the business of the Splitdorf Electrical Company in Newark, N.J.
Ref. "The New York Times," October 18, 1916 & "The Telegraph and Telephone Age," November 1,1916. (b) In 1870, Henry Splitdorf is listed as an employee of L.G. Tillotson & Co., New York, N.Y.
Ref. "The Journal of the Telegraph," August 1, 1870. (20.) Bliss, Tillotson & Co.
"...a very happy conjunction of names at 126 South Clark Street, Chicago..." "It is one of the indications of the mighty advance of population in the west which demands a house in Chicago for the provision of Telegraph supplies and repairs without the necessity of sending to the seaboard." Ref. "Journal of the Telegraph," June 1, 1868. 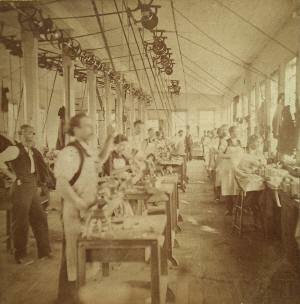 "...still another factory for the provision of telegraph, electrical, and mathematical instruments. 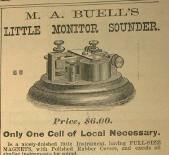 Mr. M. A. Buell has opened such an establishment at 26 Waring Block, Cleveland, Ohio, where a full assortment of telegraphic machinery may be found, and where orders for models, and instruments of every kind for electric purposes may be left and provided at Eastern prices." Ref. "Journal of the Telegraph," September 1, 1870. (a) "The manufactory occupies a floor in the large building of the Illinois Manufacturing Company, corner of State street and Eldridge Court. Appreciating the demands of the future, for Telegraph Instruments, these parties have gone systematically to work to adapt machinery to their production. Their tools have been selected from the best assortments in the country, or made by themselves, with special reference to their own work. This shop, so far as we can judge, is not surpassed by any in the country. About twenty-five men are employed....this firm manufactures and keeps on hand all descriptions of the standard Morse Telegraph Instruments. Such is the perfection of their machinery and their system of doing work, that they are enabled to produce instruments of the highest excellence..."
(b) The Morse Telegraph Registers are made from the castings of the well-known instruments made at the Caton shops of the Western Union Telegraph Company, Ottawa, Ill.
Ref. "Journal of the Telegraph," June 1, 1870. (a) In February of 1870, Edison established the Newark Telegraph Works with machinist, William Unger. In July of 1872, Edison dissolved his partnership with Unger and consolidated his manufacturing operations with machinist, Joseph Murray in the new firm of Edison and Murray. Edison dissolved his partnership with Murray in May of 1875. (b) Some of the instruments listed as being manufactured by Edison and Murray on a draft business card included: Morse Relays, Morse Registers, Morse Sounders, Morse Keys, Polarized Relays, Siemens Ink Recorders, Submarine Keys and Mirror and Marine Galvanometers. (c) In 1874, Edison and Murray was considered one of the largest telegraph manufacturing firms in the U.S. Only Western Union's New York factory, the Western Electric Manufacturing Company and L.G. Tillotson & Co. rivaled it in size. Ref. "The Papers of Thomas A. Edison," Rutgers, Vol. 1 & 2, Book Editions. "Thomas Hall ran one of the oldest telegraph manufacturing shops in Boston. He began working in 1840 for Daniel Davis, who made the instruments for Samuel Morse's Baltimore-Washington line. When Davis retired in 1849, Hall acquired part of the business and in 1857 took over as sole proprietor." Ref. "The Papers of Thomas A. Edison," Rutgers, Vol. 1 Book Edition. (25.) The United States Telegraph Manufacturing and Supply Co.
..."They have the best facilities for the manufacture of telegraph apparatus of every description. Mr. Wm. D. Sargent, who is the business manager of the company, is a telegrapher of many years experience, and an electrician of great ability." Ref. "Journal of the Telegraph," December 2, 1872. (26.) Partrick, Bunnell & Co.
"With greatly enlarged and perfected manufacturing facilities, they offer a most complete line of instruments and supplies, covering every possible requirement of telegraphic maintenance. As these gentlemen are extensively known as being thoroughly practical telegraphers, there is good reason to believe that their telegraphic manufactures will be found fully up to the highest standard of excellence in every respect. Their friends, who are numerous throughout the United States, will be pleased to note their progress. Ref. "Journal of the Telegraph," January 15, 1873. J.J.B. Frey, of New York, exhibited a self-closing telegraph key. There is some novelty in the construction of this key but none in the principle of its action, which renders it a self-closer. The platina points for closing the main circuit are at the rear end of the key, and thus, when the knob is pressed down, the line circuit is broken. The closing point of the relay is also reversed, so that the opening of the main circuit closes the local. This system of working has long been in use upon the American Fire Alarm wires and upon the European railway lines, and we think is, in some respects, an improvement over the plan generally in vogue. It involves, however, such an extensive and radical change in existing arrangements that it runs but little risk of general adoption. Ref. A report on the exhibits at The American Institute Fair by Franklin Pope, "The Telegrapher," November 12, 1870.